Veganic growing is any system of cultivation that avoids artificial chemicals and sprays, livestock manures and animal remains from slaughter houses. Alternatively, fertility is maintained by vegetable compost, green manures, crop rotation, mulches, and any other method that is sustainable, ecologically viable and not dependent upon animal exploitation. This will ensure long term fertility, and wholesome food for this and future generations. Vegan-organics is but one aspect of a dynamic culture. Our commitment is to peace and justice for people, animals and the environment in a sustainable balance. To achieve this we must change our lifestyles and introduce a philosophy which will continue to maintain our unique planet. We are motivated by our awareness of the great unease in society that we are moving towards a world that can no longer sustain life in the natural way it has always evolved. The Vegan Organic Network attempts to come to grips with politics and ethics in everyday living. To achieve sustainable agriculture there has to be a new relationship between food producers and the economic system. We do not want economic policies which condemn millions to poverty, ill health and death. In the UK we want to free the 85% of land that is currently used directly, or indirectly to feed animals. This will liberate both us and them from the cruelty of the slaughterhouse, and will release land for the production of plant foods and provide natural habitats for animals. The economics of this major change have yet to be calculated, but we consider that subsidies should only be paid to encourage this transition.Social and spiritual well-being within society can only be achieved when we work together co-operatively towards a common aim that takes crises, droughts, famines, excesses and waste out of the equation. The vegan movement has made great progress since the Vegan Society was started in 1944. It is now recognised as a healthy, sustainable, ecologically sound way for humans to live. Whether we are discussing the food that is eaten, the clothes that are worn, the lifestyles that are adopted all are available in the vegan culture. One exception remains, this is in the area of how we grow our food. Some vegans realise that this is a cause of great concern because it appears that the vegan movement has failed to give sufficient importance to this issue. Vegans need to know how their food is grown and be certain that it has not been contaminated by the animal industry. Whether this is by the use of their manure when the animals are alive, often living in appalling conditions, or by using their blood and bone after they have been processed in the slaughter house and their remains applied to the land. This is not acceptable to vegans. With these thoughts in mind three vegans, veterans of the peace, anti-nuclear movements, and sometime guests at HM Prisons, decided that how vegan food is grown was an important enough issue to consider starting an organisation. An organisation specifically directed to changing the current situation where most food that is available has been grown using animal by-products or synthetic fertilisers. This practice undermined the very ethic of non-violence that informed their philosophy and actions and is basic to vegans. These were David Stringer and Jane and David Graham. They discussed this issue in Jane and David’s house in Chorlton, Manchester, in the summer of 1996. All were long standing vegans with a background in horticulture, agriculture and the food industry. They discussed with their friends what interest there might be in starting a movement to promote vegan-organic horticulture. Their response was very positive, especially from Kathleen Jannaway and Alan and Elaine Garrett of the Movement for Compassionate Living. Encouraged by this, and the philosophy that in order to change the world it was not sufficient to philosophise – you had to organise, they did just this. The organisation was called the Vegan-Organic Horticultural Agricultural Network – VOHAN. More support came from VIVA!, The Vegan, Vegan Views , VEGA and many vegans. 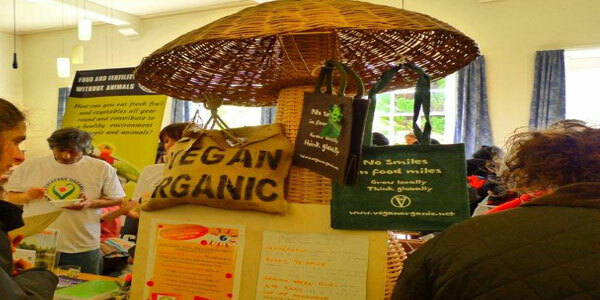 Meetings were organised up and down the country with vegans, many of whom were already growing using vegan–organic methods. This provided an opportunity for VOHAN to raise money, gain members and offers of help. Jane and David’s house in Manchester provided the office and meeting place. With the purchase of a computer and photocopier they were up and running! Minor changes took place such as changing VOHAN to VON – easier on the ear and much simpler to say especially on the ‘phone. Particularly the full blown Vegan-Organic Horticultural Agricultural Network! With help from local members the campaign was launched. From the outset they saw vegan organics not as a single issue campaign, but as an integrated international movement. Their vision went beyond the central aim of vegan cultivation; it also embraced an alternative view of market economics, of cooperation, and a movement for land reform and redistribution. Because of the need to communicate with its membership and to promote our ideas more widely VON published its journal VOHAN NEWS INTERNATIONAL now called GROWING GREEN INTERNATIONAL, edited by Tony Martin. This is produced twice yearly, bearing the distinctive VON logo. Articles on research, the theory and practice of vegan-organics and the broader ideas of ecology, non-violence, social justice and the abolition of animal abuse are discussed. Growing Green International is now recognised and widely read among those concerned with vegan-organic cultivation in many parts of the world. VON gave financial help to members in Austria to launch their publication “Regenwurm”. GROWING GREEN INTERNATIONAL brought together more people already using vegan-organics, most of them being unaware that others had adopted this system of food production. VON developed a worldwide membership with the aim of promoting growing food without the use of animal manures, slaughterhouse by- products, artificial chemicals or genetically modified material. This, together with crop rotation, green manures, compost and chipped branch wood forms the basis of vegan-organic growing. VON made a subtle change from the term most widely used in animal free agriculture which is stockless to stockfree. This change was considered to be more positive and progressive. Stockfree is now widely used. The expansion of VON moved quickly in the first two years through contacting organisations such as Elm Farm Research Centre, Henry Doubleday Research Association, Soil Association, The Cooperative Society who were already undertaking research into vegan-organic cultivation. Most importantly contact was made and meetings arranged with hitherto unknown vegan-organic commercial growers and researchers such as Iain Tolhurst of Tolhurst Organic Produce in Pangbourne; Dave of Growing Green, Darlington; Alan and Debra Schofield, Growing with Nature, near Preston. Through their box schemes they were feeding over 1000 families a week with vegan-organically grown food. Since then more vegan-organic growers have joined VON. Farm lists were widely circulated encouraging members to volunteer in order to get “hands on” experience. A questionnaire / survey proved popular by carrying information of local contacts and land for sale. 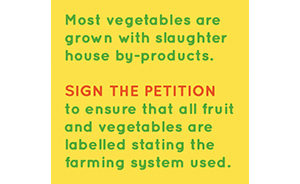 Information Sheets were written covering most areas useful for vegan growers. VON’s publicity leaflet listed 40 groups and organisations that supported its aims, plus significant individuals like Benjamin Zephania, Robert Hart and Dr Michael Klaper. The first of a series of “Growing vegan-organic” courses was organised at High Lane. Courses have become a regular feature of VON. The farm visits to Tolhurst Organic Produce together with Iain Tolhurst’s commentary and seminar added immeasurably both to the confidence of practising and prospective vegan-organic growers and to the status of VON. There are three main strands to making vegan-organic grown food more widely available. To specify the methods and standards for Veganic growing and to enable growers to become certified using these standards. To support Demonstration, Education and Research Centres. To encourage vegan-organic cultivation on a small scale as well as farm scale growing. The first important objective was to establish the Vegan-Organic Standards. For all agricultural methods to be coherent and communicable to growers there has to be clearly defined standards. The Soil Association lay down rules for organic growing which allows the use of animal by-products. Clearly these were not acceptable for vegan-organic food production but were a good starting point. VON realised it had to produce its own standards and so based these on the Soil Association standards. Over a period of two years a working group wrote and refined a set of standards – the Stockfree Organic Standards. VON was fortunate to have the expert guidance of Iain Tolhurst and Dave of Darlington. They had been providing vegan-organic box schemes for over 10 years. Jenny Hall, experienced in vegan-organic cultivation, setting up box schemes from scratch and knowledgeable in theory and practice, ably articulated all the concepts in the final document. It took VON a further two years of intense consultation with the Soil Association, numerous groups, individuals, farmers, growers and supporters in several countries, before the SOS were agreed. So it was that in October 2004 the first of these aims was achieved when the Soil Association Certification Ltd (SA Cert.) appended the Stockfree Organic Standards (SOS) to their own inspection process thus giving farmers and growers the opportunity to be aware of, and to apply for SOS status. Farmers and growers wishing to adopt animal free organic cultivation are now be able to obtain both the Soil Association and the Stockfree Organic symbol simultaneously. VON has now set up a new department, Stockfree Organic Services, this deals with all queries relating to the Standards; issues application packs and offers advice and support. SA Cert. carries out the inspection and certification on behalf of the Stockfree-Organic Services. Although the Stockfree Organic Standards do not represent the views of the Soil Association their inclusion with SA Cert. confer an extremely important status giving them international recognition. The Stockfree Organic Standards offer an ethical and pragmatic beacon of light for the future of food production and products as it affects vegans, ecology, human and animal wellbeing. VON is most fortunate in having some extremely dynamic growers who have already signed up for the Standards; these are Tolhurst Organic Produce in Pangbourne; Berkshire, Northop Organics in Mold, Oakcroft in south Cheshire, Growing with Nature in Preston Lancashire and Bluebell Organics in Co Durham. These have wide influence and many contacts in the organic movement; Glyndwr University is now running foundation degree courses including Stockfree-Organics, which will be a tremendous asset to the enduring viability of these methods. VON has arranged for a bursary scheme to help those who wish to study the subject – further enhancing the long term picture, as today’s students are tomorrows practitioners. VON must now create the demand for animal free food grown in accordance with their Standards. It can only do so successfully with the cooperation of vegans and vegan organisations. The second objective has proved more elusive. There have been possibilities for Centres in Wales, Scotland, Heywood, Lancashire and elsewhere. For legal, ecological and social reasons these did not materialise. Having received a substantial legacy The Movement for Compassionate Living have lodged part of this – £70,000 – to help towards providing demonstration facilities. Iain Tolhurst and Phil Handley of Northop Organics are now both SA Cert. and SOS symbol holders. And as both are not only working farms, but also provide extensive demonstration and educational facilities, the need for a fairly large acreage of land attached to a Centre as originally envisaged is under consideration. VON is now reviewing the criteria for establishing a Centre. In 2009 an innovative project to establish educational resources at existing stockfree locations has been developed. The third aim progresses well with our members being the backbone of using and promoting the vegan-organic method. 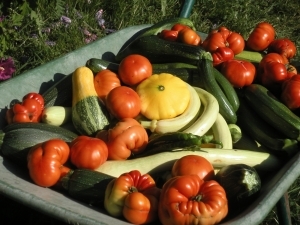 Growing Green International reports on the spread of vegan-organic growers in different countries such as New Zealand, Canada, Austria, Germany, France and the USA. VON intends to set up a certification system for for small scale growers to add a further dimension to the SOS so that they can display a symbol when meeting their customers face to face e.g. at farmers markets. Slowly but surely the symbols will become known together with the ethics that inform the Standards. To advance these aims, which require a great deal of money, it was decided to apply for charity status and Peter White worked with our solicitor to arrange this. By registering as a charity we are able to apply for funding, obtain tax relief on donations and give more weight to our objectives. In August 2000 the Vegan-Organic Trust (VOT) was registered with the Charity Commission, number 1080847 with seven trustees. Although the Trust was registered in the UK, its constitution allows for operation in any part of the world. In order to facilitate the setting up of a demonstration centre, the charity is also a registered company limited by guarantee number 3869080. Being a limited company assists our power to buy, lease or be given land and property, which will be held in the name of the charity. The Trustees, who are unpaid, are the directors of the charitable company for which they have full responsibility. The original trustees were David and Jane Graham, Peter Niederlag, Diana and Peter White, John and Susan Wyncoll. After giving six years of valuable service John and Susan Wyncoll and Peter Niederlag resigned. Patrick Browne, Graham Cole, Rochelle Phillips and Ziggy Woodward since became trustees, with Patrick resigning as a trustee in September 2005 and Ziggy resigning in February 2008. In March 2005 the name of the charity was changed to The Vegan-Organic Network in keeping with the main title of the organisation. All those who support VON through membership are formally supporter members. In keeping with our ethical concerns VON banks with Triodos Bank and can reclaim tax paid on certain donations in the UK and some other countries. Annual accounts are examined by independent accountants, and a copy of the latest accounts is available as well as VON’s governing documents*. There is an urgent need for vegans to promote the idea of growing food vegan organically and seeking out sources to purchase this food and to ask how the food is grown in places that sell organic produce. We must create the demand for vegan-organic food from growers. Currently the main source of such food is via box schemes. These will continue to grow and make a crucially important contribution both in supplying need, involving the community, generating employment, and by demonstrating an alternative system of marketing. It is, nevertheless, important that vegan-organically grown food is also made widely available. VON has no illusions about the work that is required to get its message over to growers and the public. And the public needs to make critical choices in view of the ecological crisis. The intensification of production, brought about through the development and use of synthetic chemicals, mechanised farm machinery and high yielding hybrid seeds, has devastated the soil, water resources and farmland ecology, causing irreparable damage to agricultural land and raising concerns about long term ecological sustainability and loss of wild diversity. Food production is but one aspect of a dynamic vegan culture which embraces justice for people, animals and the environment in a sustainable balance. To achieve this we must change our lifestyles and introduce a philosophy which will continue to maintain our unique planet. We are motivated by our awareness of the great unease in society that we are moving towards a world that can no longer sustain life in the natural way it has always evolved. Thus supporters attempt to come to grips with politics and ethics in everyday living. It has been said that until compassion embraces all living beings we will not find peace. VON needs practical support now more than ever. Despite the movements successes the membership has remained more or less static since its inception. It would seem that the majority of vegans do not make the connection of the exploitation and death of farm animals and how their food is produced, or VON must work harder bring this connection to their notice. One of VON’s objectives is to try to rectify this – we aim to have 1000 members within the next 2 years. If every member recruited another this would be achieved much faster! There are different kinds of hunger. On the one hand there are 800 million people in the world today living on or below the breadline; on the other there is the insatiable hunger of the world’s large corporations for profits. The hunger that drives those in VON and most vegan groups and organisations, is a hunger that craves for social justice based on non-violence. VON has a wide membership with a highly motivated and focused working group based in Manchester. Together with our members we will strive to achieve our objectives. We know that our cause is worthy and that people of goodwill with a belief that a better world is possible will join us in our mission.The vegan movement has made great progress since the Vegan Society was started in 1944. It is now recognised as a healthy, sustainable, ecologically sound way for humans to live. Whether we are discussing the food that is eaten, the clothes that are worn, the lifestyles that are adopted all are available in the vegan culture. One exception remains, this is in the area of how we grow our food. Some vegans realise that this is a cause of great concern because it appears that the vegan movement has failed to give sufficient importance to this issue. Vegans need to know how their food is grown and be certain that it has not been contaminated by the animal industry. Whether this is by the use of their manure when the animals are alive, often living in appalling conditions, or by using their blood and bone after they have been processed in the slaughter house and their remains applied to the land. This is not acceptable to vegans. Finally a big thank you to everyone who has helped to progress VON’s work! To those who have recently joined, your participation is welcome! If you would like to give specific help so that we can achieve our aims, please get in touch.